What is better for brightening up this dreary spring weather than a brightly colored sweater? Today’s post features 3 ways to style a cropped sweater. There’s an option for any event and any body, so don’t be afraid to try it out! I fell in love with this sweater because of its perfect mix of comfort, function (crop tops are great for breastfeeding), and style. The mostly black and white piece had just the right amount of color for someone like me, preferring a mostly neutral wardrobe. 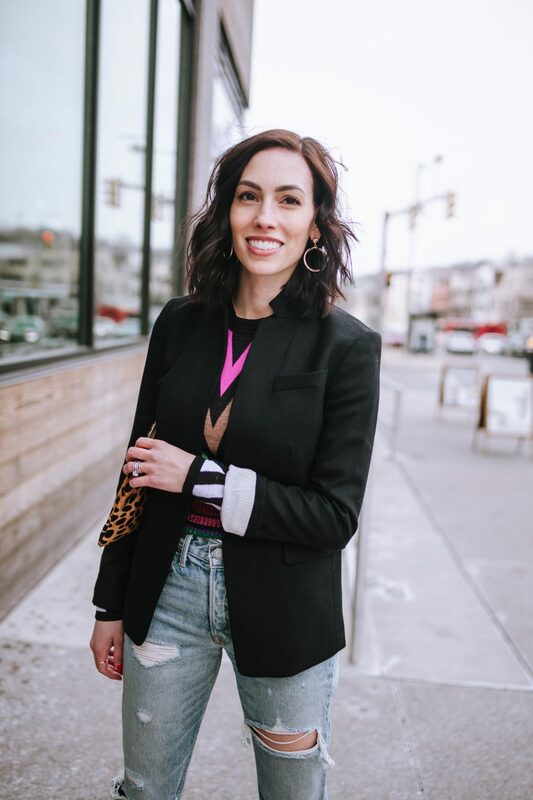 I prefer it best paired with a great pair of jeans for an easy weekend outfit that really stands out, but it works equally well for the office and dressed up for a night out. 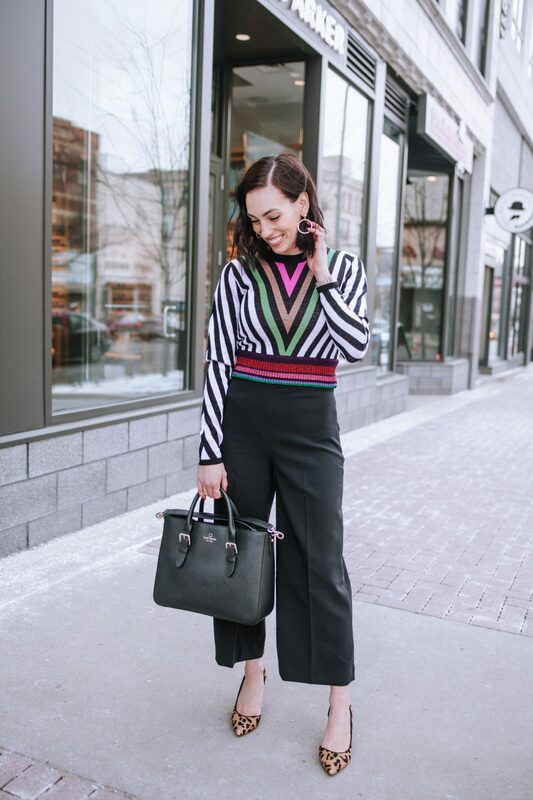 Obviously, for a professional setting, you’ll want to style this sweater (or one like it) with a high-waisted pant. Showing midriff at the office is usually not the best move. Though in some workplaces it could actually be totally acceptable, for most it probably is better to opt for a more conservative styling. I’ve been favoring these culottes with a classic pump for office attire. They are still on-trend and so comfortable with that wide flowy leg opening. I think this would look fantastic with a floor-skimming pair of trousers as well, but I can’t fit into my pre-pregnancy pants to rock that at the moment. I’m always one to keep accessories pretty traditional for the office–a simple hoop earring and a structured black tote bag are classic additions to the overall look. They add just enough without looking overly done. You know I can’t get enough of this pair of distressed denim jeans. I wear them with absolutely everything; hands down my favorite pair of jeans. They are high waisted enough to make me feel comfortable post-pregnancy and I love all of that distressing for a bit of edge. Pairing them with a pair of plain white sneakers is such an easy and casual look–absolutely perfect for weekends. Wear this to go shopping, run errands, or to meet up with friends. It’s comfortable and still really cool. Don’t forget a backpack for all of that running around–always a plus to be hands-free when you’re taking care of business. Yes, same jeans again. I told you I loved them! I added another layer to take my casual look up a notch; the blazer adding a more dressed-up feel to the look. You can also swap those plain white sneakers with a pair of sock booties to pull the entire look together, creating a much edgier feel all around. You could also pair this whole look with a leather jacket and a pair of heeled sandals–either one would work really well with these pieces. A cropped sweater is a fun piece to add to your wardrobe, and works incredibly well when paired with a classic high-waisted silhouette. Don’t be afraid to give one a try! With high-waisted wide leg trousers and strappy heels. Tell me, how would you wear it?